In our Beginner's Guide to Evolve we show you tips and tricks and with our comprehensive beginners' guide you can go hunting successfully. But monsters are not too short. We show you some tactics, which are essential in the fight against your captors. The Jetpack brings the hunters quickly from A to B. But even here there are some tricks for newbies. Once you've unlocked the perk for faster Jetpack regeneration, you should also select it. So you're back on the road faster when you run out of fuel. In addition, you should not use the jetpack permanently. Press the jump button twice quickly to make a push in the direction of view. Go from a high to a lower platform, then use the jetpack at short intervals. So it saves significantly on fuel. If you run out of fuel, you can still climb steep walls. The jetpack does so with no fuel. Go to the wall and hold the jump button to slowly slide up. At the beginning you stand Maggie with her little monster Daisy available when it comes to revealing the monster. If the latter times but can not record a track, there is other evidence to you can look for. On the one hand, leaving each monster tracks on the ground that glow blue. Sneak the monster, but also eliminate them. You must rely on your ears. Each monster spreads typical sounds that can differentiate their time from the others. And the environment gives you an indication of the position of the beast. Situated Startled birds are shown on the map. Down trees you have to discover by careful observation. There are countless animals and plants that you want to the leather on each map. At least the hunters have to fight with. The monster uses this usually as prey. As a hunter you need them most concern in the group or liberate captured members. But you concentrate mainly on the fight against the monster. Exception to this is the so-called albinos. This give you when you complete a bonus that lasts for a few minutes. This can be a great advantage in battle. However, more can be active just a bonus. Gather a new one, losing the other. There are 18 perks in Evolve. Nine for the hunters and nine for the monster. In our review we will show you all the perks and the best use for this. Damage Reduction Reduce damage Good choice for each monster. Select if you too quickly out of breath. Smell radius Increases the radius of your smelling ability, with the tracking her creatures Especially for creeping monster a blessing. So enemies are detected early. Movement speed Increases the movement speed of the Monster Good choice for the Kraken. He is incredibly fast. Increase endurance Increases endurance of the Monsters So you can often jumping. Good choice for all monsters. There are four game modes in Evolve. The fifth, evacuation, strings together several matches and combine them with a little story. Thus, the winning team always gets a little advantage in the ensuing battle. We show you which modes are available and which tactics offer themselves. Hunting The hunter must kill the Monster. This eats to develop. At Level 3, it can destroy a power relay and so also win Monster must be careful that we do get involved until later in the evolution of a fight. The hunters have let the monster is no time to develop. Nest Hunters must destroy six monster eggs or servant. The monster has to complete the hunter. Hunters must quickly from one egg to the next and the monster should have come to him. Monster breed quickly from an egg and try as soon as possible to develop. Rescue Hunters need to heal survivors and bring to a landing ship. Monster must do this. As monsters you have it easier here. Concentrate only on the survivors and warps you back then. The hunters need a good healer. Defend The monster must destroy three generators in a certain order. The hunter must stop them. Acting as a monster only together with the Minions. Hunters have easier time: First all attack the alpha male of the Minions, then. For the hunter, it is essential to work together. Will always remain with the group and indicates directions of travel with the marking function. In addition, the roles are also selects its binding. This means that the Medic should not suddenly run headlong into every fight. Instead remain somewhat aloof and heals when needed your fellow players. Only when the team combined its skills, it can stand against a powerful monster. Once you gether enough friends to fill in a team, you have to communicate with the other players. Signal, as already noted, the running direction with the markers. Follow the trappers and retain the movement of all players on the map. You can convey valuable information via voice or text chat. So also eliminated players integrate. In the observer's perspective, you see the monster often sooner and can warn your teammates. Here you are not allowed to play the hero. It helps the group, not if you throw yourself early in the game to certain death. In particularly, support can quickly search with cover the distance. Tuck you put yourself or to your next destination until the landing ship arrives and your team members to participate again. Defeat then the monster, you are the hero. 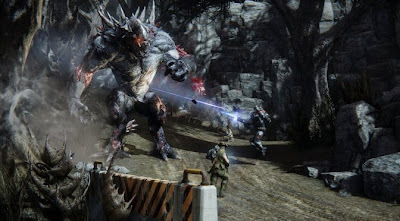 In Evolve, its new classes unlock by using skills of previous characters. So you concentrate on the tasks that you see at the conclusion of each match. Often try to switch between the skills and equipment. So you quickly get the star and thereby improve even the skill. To achieve a higher level quickly in Evolve, you should plunge yourself into the evacuation mode. There are five matches are strung together. In addition, you get experience points for each completed or rescued residents Shears. Also completing all five games again bring plenty of points to your account. So it increases with a completed evacuation mode usually one to two levels. Repeat the procedure and focus on the skill tasks for each class. These provide more extra points. The skill of Monsters is important to hunters to be one step ahead. Who only moves quickly across the map, leaving too many traces and is easily found. Sneak and leave no traces. Thanks to the surreptitious attacks Wildlife turns off silently and quickly. She eats the same and will revert to crawl. In order to misleading hunters, set some common steps in a certain direction, begin to sneak away in the opposite direction. But if the hunters get closer, you can hide yourself in bushes. This tactic is more successful than you might think. The hunters see you there and usually run on. Never stay long at a position, since they must follow you. So wait motionless in the bush until they have removed and then print your heels in a different direction. With these tips, you can develop unmolested, and then go into the fight. It is important not to go straight to the first evolutionary step in the fight. Then you are easy prey. Try to reach at least level 2 and build your shield by eating before you dare you to hunters. But even then, it is important not to blindly pursue the enemy. Seek out always a weak target. These usually include Medic, and support that you can make life difficult for their healing and support capabilities. Take only at the end of the assault before, as this can withstand the most and is otherwise revived by the others. If one of your opponent on the ground, it may be worth more to him yourself embark until he ceases altogether. Then he has to spawn again with the landing ship. This takes time and makes other vulnerable. Particular attention should give Lazarus and Daisy. They are the enemy team, you will have a hard time. Lazarus can revive already fallen hunter. And Daisy is one quasi as a fifth member who can revive and also must be destroyed. Then concentrated on Lazarus and let you retire. Always complete it before you dedicate yourself for all others.